A Fellow Chevrolet Camaro Berlinetta fanatic has spend countless hours in an effort to digitize the GM Camaro Berlinetta Electrical Diagnosis paper manual ! After using this site for a number for years to distribute his work he has decided to allowed me to distribute our collection to the public directly. These wiring diagrams cover ALL Camaro Berlinetta - Coupe - Z28 & IROC Z electrical systems for the 1985 model year. The internal wiring systems for the Third Generation Camaro cars can be broken down into a few ranges. They include: 1982-1983, 1984-1987, 1988-1989, and 90-92. There are many examples of changes from year-to-year,..... and many of the systems remained very much the same for all 11 years of production. The listed ranges are simply given to guide you to the best matching wiring for your project ! .The "Digital Camaro" is now available by a Downloadable .ZIP file. . 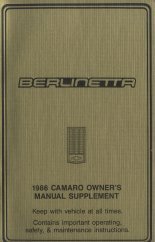 In addition to the Wiring Diagnosis Diagrams; the 'Digital Camaro" .ZIP file also contains the 1986 Chevrolet Camaro Berlinetta Owners Manual Supplement from cover-to-cover ! I've also add images of vintage Berlinetta marketing media from past magazine advertisements, as well as the complete 1984 - 1985 & 1986 Chevrolet Camaro Dealer Brochures. This is easily the most comprehensive collection of Camaro Berlinetta information ever gathered together !! It's is an invaluable resource for anyone wishing to retain their Berlinettas' original appeal, or to anyone restoring one of these Antique Camaros ( yes - they ARE Antiques now ! ) back onto the street where it belongs !!!!!! To get more details on how to buy your own copy of the Digital Camaro .ZIP file ! Here is a Sample Wiring Diagram: click on this image to see a FULL SIZED version taken directly from the Digital Camaro !